the Company Hi-Tech Home Apartments already briefly mentioned in the February digest of the exhibition "Mikhail Shemyakin. The artist and the theatre". Now offer interested guests renting our apartments for rent in the center of St. Petersburg, visit her acquainted with a brief overview of the theatre Museum and the exposition. There are many things in the movie are admirable. Of course everything about theatre arts, deserves attention, but I want to focus now only one aspect. Anyone coming to the theater people, once in the auditorium before the submission meets with the scenery, and then with the characters and their costumes. But any performance begins not only with the rehearsal of different scenes, but with sketches of costumes and scenery. But from the imagination of the artist depends on the whole atmosphere of the future performance. From his vision, and in no small measure depends on the future success of the production. Not a lot of artists-craftsmen, on which depends much of the success of future productions. One of these recognized masters is Mikhail Shemyakin. From the biography of the artist know that he was born in Moscow in 1943, grew up after the war in East Germany. At 13 years old the year the family returned to the Soviet Union and Mikhail Shemyakin goes to art school at the Institute of painting named after I. E. Repin Academy of arts. From which later he was expelled for failing to socialist realism. For a long time worked as a labourer, including a scaffolder at the Hermitage, was subjected to forced psychiatric "treatment", and after not successful attempts at "treatment" was in 1981 and expelled from the Soviet Union. He lived in Paris and then in new York. Was promoting Soviet artists and writers, nonconformists. In the perestroika trends Shemyakin returned to the USSR, where the widely is at various exhibitions of their work. Has the Russian era, the number of exhibitions is not reduced. Shemyakin is positioned as a sculptor and as a theater artist. 2001 is marked by the work on the production at the Mariinsky theatre of ballet "the Nutcracker". In 2005, based on the tale of Hoffmann to put the ballet "Magic nut". two thousand years represent a tremendous creative success of theatrical productions. this is a multiple biography of the Shemyakin and you can finish and start to talk about the exhibition of the artist in the Saint-Petersburg Museum of theatrical and musical art are located on Architect Rossi street, 2A, and the entrance is located on Ostrovsky square near the Alexander theatre. Already at the entrance to the Museum almost immediately faced with an electro-mechanical doll that reacts to your movement and playfully hides his face behind a mask. Also immediately to the left upon entering is a cozy cafe where you can sit before or after visiting the Museum. It's especially useful if You plan to visit the permanent exhibition and listen to the story guide. Next, passing mechanical ladies again on the left is located the Museum ticket office and a dressing room where you can undress. The exhibition "Mikhail Shemyakin. The artist and the theatre" located on the fifth floor of the Museum building. Climbing the stairs, already in her face with a variety of creative things, for example an illuminated staircase with the names of theatrical stars of different eras and a Smoking area. Although is it really in the Smoking area or just a creative way remained a mystery. the Exhibition is compact enough and located in two halls. The first hall is dedicated to the Venetian carnival and theatrical costumes. Here are historical photos of the Venetian carnival, which Shemyakin presented their costumes. In other, here not only suits, but also their sketches. the Second room, in my opinion, the most interesting. It presents thumbnail pictures of costumes and scenery, masks, jewelry, jewelry and porcelain, wigs and models of scenery for such productions as "the Nutcracker", "the Magic nut" Metaphysical ballet", "Meek", "the rite of Spring", "Coppelia" and some others. It should be mentioned that porcelain miniatures made according to the original sketches of Mikhail Shemyakin at the Imperial porcelain factory, And Jewelry, which participated directly in the productions, in cooperation with the jewelry house Sasonko. the exhibition will last till 16 APR 2017. 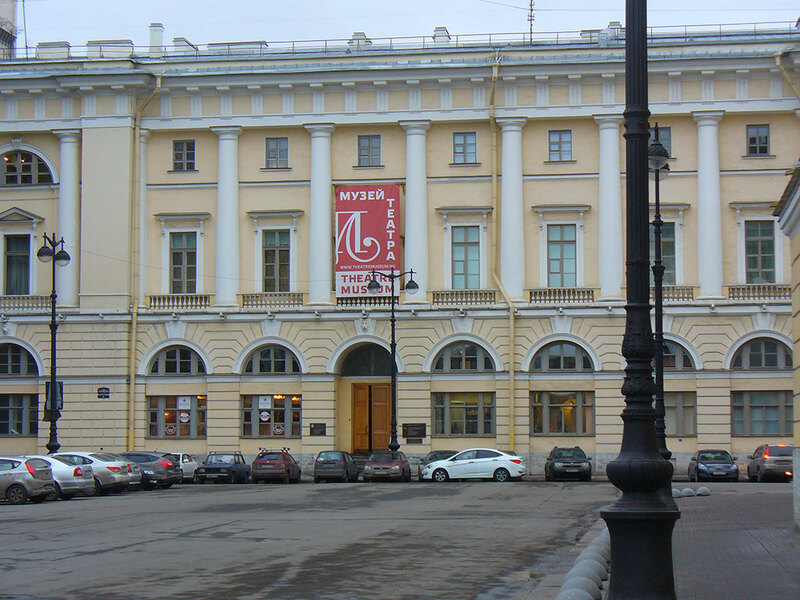 Details about heart of the Saint-Petersburg Museum of theatrical and musical art, the exhibitions and events can be found by visiting the official website of the http://theatremuseum.ru/. the Cost of attending exhibitions is very affordable and is 100 rubles. If You will walk along Nevsky prospect or are going to visit in the Alexandria theatre, then look at the box and see, perhaps, the whole exposition will be very helpful. If Your plans do not include a visit to the Museum, cozy cafes will also have to taste. And comfort our apartments in Saint-Petersburg also, as always, at Your service!